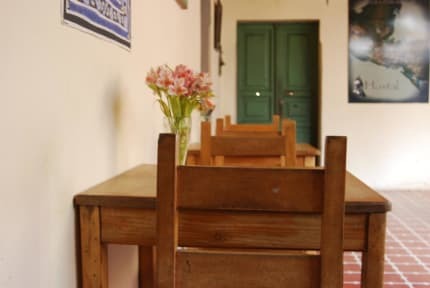 El Hostal Bed and Breakfast has a Group Cancellation / Modification Policy of 1 Week before arrival date to make any changes to the original reservation. If the Group Booking it`s made 6 weeks or more before arrival date, a NON REFUNDABLE 50% of the remaining balance will be charged to the guest credit card. There will be a charge of 100% of the balance for No Show Policy. 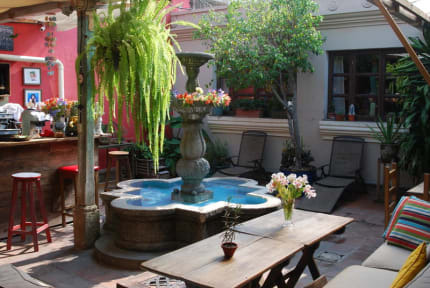 Our 100% family-owned and locally operated hostel is nestled in the colorful streets of Antigua, Guatemala. We strive to keep the rich culture of this historic city alive with our in-house tour agency and sustainable restaurant that serves fresh meals, smoothies and drinks made with care from locally-sourced ingredients. Our warm atmosphere attracts adventurous travelers, humanitarians, musicians, artists, and friends. They come to relax and rest their heads in between climbing volcanoes, wandering the cobblestone streets, through ruins and colorful colonial architecture. They leave with their curiosity peeked about Guatemala, their stomachs fulfilled, and as a part of our family. Great hostel perfectly located near city center, clean and attractive space with friendly staff and good breakfast for 20Q. Loved my stay here and met some amazing people! Antigua is beautiful, and this hostel helped us book tours and things to do so we could explore and make the most of our short time there. It’s right across from Cafe No Sé which is soooo fun and popular. Cafe Sky across the street had amazing food. Nice showers. Super comfortable beds. Great friendly staff. Awesome food. Love love love. I love this hostel so much. I kept coming back to Antigua and El Hostal during my time in Guate so stayed here three different occasions. Obviously the other guests in a hostel change and so the atmosphere changes a bit, but the staff is always so kind and helpful and funny and it just feels so chill and welcoming here. Not a party hostel but located near bars and on a great street. Upgrade the breakfast it’s worth it and say hi to people in the courtyard I always made really nice friends. We had a very nice stay, very nice atmosphere, staff was very friendly. However, we were bothered by the very loud bar opposite the hostel in which noise went on until late in the evening. We also had quite a disturbing experience as a volunteer and one of the girls in our dorm didn’t just sleep which we thought was quite disrespectful. The staff were good especially the morning staff. The place was very clean. Was more on the pricier side. They have a bar/cafe set up in the common area but it does lack an atmosphere. It’s not bad - I like what they’re trying to do with local-run hostel x BnB vibe. Not a lot of atmosphere given the small courtyard and limited amounts of rooms. Location not bad but a bit of distance from the action. Nice hostel with clean bathroom. The personal was very friendly and helpful.